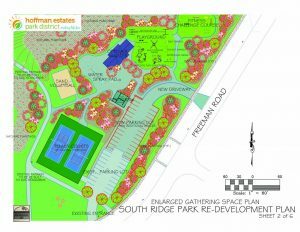 In fall 2018, the park district is submitted an application for an Open Space Lands Aquisition and Development (OSLAD) grant to make major improvements to South Ridge Park. In late January 2019, HE Parks was notified that $400,000 has been awarded from the Illinois Department of Natural Resources (IDNR) as part of the State’s FY 2019 OSLAD program. This project was one of 89 local outdoor recreation projects, representing approximately $28,974,500 in funding assistance approved by the IDNR for FY 2019 OSLAD grant funds. 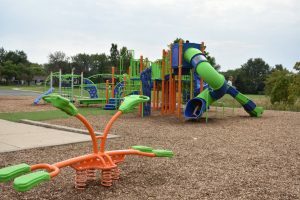 The mission of the Hoffman Estates Park District is to “offer healthy and enjoyable experiences to residents and guests by providing first-class parks, facilities, programs and services in an environmentally and fiscally responsible manner”. Quite simply as our tagline states: we are “making life fun”. Our most recent Comprehensive Master Plan, which included a community-wide survey, identified the need for a north Hoffman Estates water attraction, specifically a water play feature. 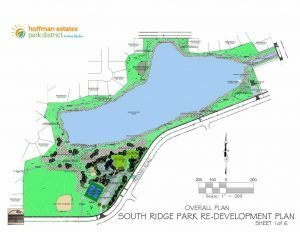 As such, we have developed a major renovation plan of South Ridge Park, located on the north side Hoffman Estates, to provide such a community attraction. This grant money, along with funding from our park partner AMITA Health, special recreation dollars for ADA requirements, and reserve funds of the District (no tax increase), will enable us to complete this project. Our intent with this project is to improve the quality of life for residents on the north side of town and throughout the Village of Hoffman Estates and the northwest suburbs, by providing exciting and free outdoor recreation and wellness amenities. The centerpiece of this park is an expansive, 4,000 sq. foot entertainment splash pad with spray effects, exploratory waterspouts, and interactive squirting displays. The splash pad will use an environmentally-friendly filtration system designed to recycle the water and will eventually pay for itself, essentially providing the water supply for free after ten years. However, this is just one of the many incredible recreational, and wellness benefits that will vastly improve the quality of life for residents in our community. The park will be free of charge and fully accessible to everyone through full ADA compliance. It will provide diverse and exciting offerings for residents of all ages and cultural interests. Revamped sports fields will accommodate a new array of multi-cultural sports options including cricket, soccer, rugby, ultimate Frisbee, Lacrosse, field hockey and baseball. Many exciting sporting and fitness events, such as tournaments and mini-triathlons, will be held at the park. The park will offer highly-desirable and inviting free fitness and recreation opportunities to people of all abilities. An exciting new Fitness Challenge Course will be built for adults and children that will provide athletic cross-training for all ages through a series of physically demanding obstacle-course equipment stations, similar to the popular TV show, “Ninja Warrior”. The structure will allow the park district to offer new fitness programming options in the form of group fitness classes, races, and cross-training workshops. For those with mobility challenges, the plan includes an entertaining and inviting playground remodel with a fully-accessible artificial turf fall surface that allows wheelchairs easy access. For toddlers and those with sensory needs, an attractive and fun nature sensory play area is planned for age 2-5 that will teach kids about nature while delighting the senses with interactive exhibits and amusing play structures. An attractive open air shelter will be built for party rentals that will include a charcoal grill and electricity and will accommodate 6-8 picnic tables. Groups attending parties at the shelter will have a full view of and access to the splash pad and Fitness Challenge Course, which will make the shelter and the park a highly desirable outdoor party venue for the community. The park plan includes a paved, two-mile trail system that connects four of our premiere parks and offers visitors the ability to explore all four parks with just one visit. The plan includes enhancing the landscaping and supports our conservation efforts with an environmentally-friendly naturalized lake shoreline that will include native plants to encourage the growth of the Monarch butterfly habitat. Further, a variety of new trees will be planted that will qualify the park to be a certified arboretum by ArbNet. Each tree will be properly labeled and the district will offer educational programs to educate the community on the importance of trees and conservation. The trees will further enhance the beautiful surroundings and add value to the neighborhood. An upgraded fishing pier and kayak launch will be added. The pier will further enhance our already popular fishing lessons program and support the annual Fishing Derby held by the Hoffman Estates Chamber of Commerce that is held at this park. The kayak launch will be a desirable new addition that will bring new appeal to the lake with the paddle sports programming we will add. Pickleball is a sport that has seen tremendous growth and popularity in our area, particularly with seniors. To meet this need, we will add pickleball lines to the existing tennis courts and will offer pickleball lessons in addition to outdoor tennis lessons. Further, the existing sand volleyball court will be programmed for lessons, leagues and tournaments. The existing parking lot will be more than doubled to accommodate the many additional new visitors to the park annually. Lastly, a fully ADA-accessible restroom shelter will be built. 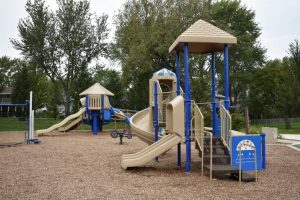 While the district’s park staff will perform the demolition of the playground, local contractors selected through a bid process will complete the majority of the work. The plan already has approval from the HE Parks Board of Commissioners. In addition, local residents in the neighborhood are in full support of this project and demonstrated their overwhelming enthusiasm by presenting a petition with nearly 200 signatures at a recent public meeting. 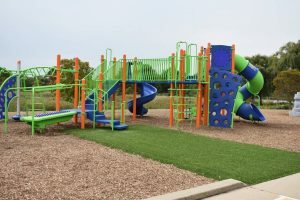 The Hoffman Estates Park District hosted public meetings to discuss the renovations of Community Park and Willow Park: Community Park renovation included discussions on the replacement of the playground, renovation of the splash pad, and the addition of asphalt games. This meeting was held Wednesday, December 19th at 6:00pm, in Triphahn Center’s room 114. 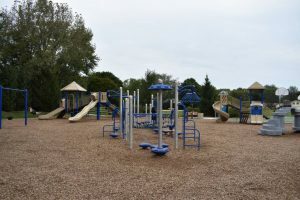 Willow Park renovation included discussions on the replacement of the playground, and the addition of a Pickleball Court or a passive parkway where the old “Safety Town” is located. This meeting was held December 19th at 7:00pm, in Willow Recreation Center’s conference room. The Hoffman Estates Park District applied for and received the IAPD/Gametime matching funds grant for both Community and Willow Park. Both parks are being designed to meet Playcore Play On criteria. These parks will be National Demonstration Sites for Play On, promoting physical activity. Stay tuned for renderings of both parks! Construction at Willow Park, located north of the Northwest Tollway at 905 Norman Drive, is receiving a different type of playground. The new playground contains exciting climbing and play structures, sensory panels and the district’s first tandem swing. This swing allows an adult and child to swing facing each other. To fulfil resident’s requests, HEParks is converting an unused paved pad to a passive recreation refuge with trees, benches and grass. A new turf path will link the picnic pavilion and the playground. The current basketball court will be relined to include basketball, foursquare and hopscotch markings. Community Park construction will take place in two phases beginning. Phase one will include a complete reworking of the splash pad including moving the spray pad to a new location away from the street, doubling its size and adding more spray features. Surrounding the splash pad will be privacy and safety landscaping. The splash pad will be ready for residents this summer. The second phase of construction involves converting existing features to an area with basketball courts, asphalt games and open green space. Phase two also includes a complete reimagining of the playground structures. 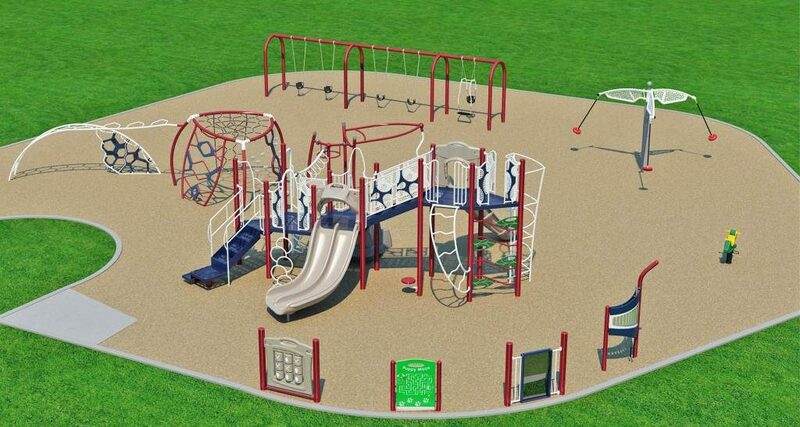 The new playground will combine the tot and advanced play structures into one play area. Included in the plans is the District’s first arch swing which allows four people to swing together on one large swing.